I love baking! 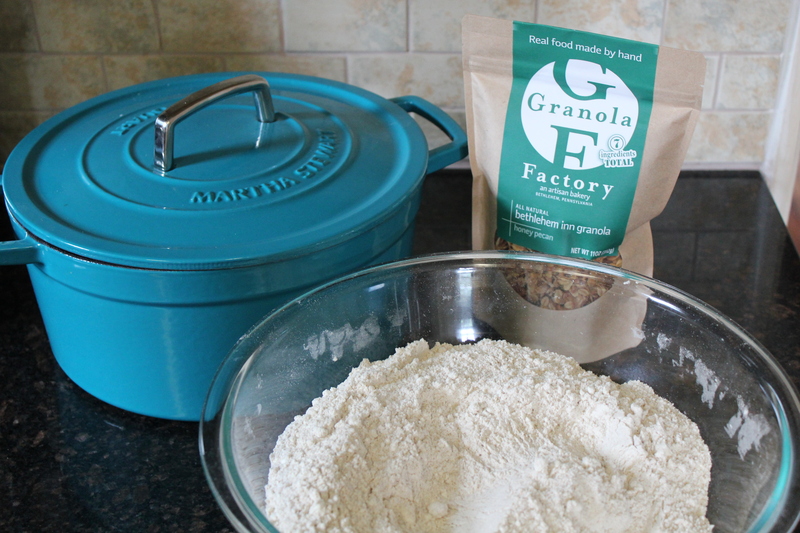 You might hope this is the case, especially since I am one of the bakers at The Granola Factory. But really, I get to wake up everyday, put on some comfy workout clothes, walk a few blocks to the bakery, and spend my work day creating delicious, wholesome granola and our truly decadent Bethlehem Bars, all done with some awesome people! Music plays a major role throughout the course of our day, either as a rhythmic aid to keep production moving along or simply, just for background noise. In the last few months, I have learned that Rebecca (our Baking Manager), likes to mix granola in our back oven station to some “angry/screaming” rock music…don’t worry, she still bakes with love:) Sue, Granola Factory’s most efficient baker (she is a machine! ), kindly deals with all of our music preferences, unless a Pitbull song comes on. She wants nothing to do with this! And, catch this, Calvin (Chief Baking Officer and our “all things behind the scenes” business guy), feels most productive with bagging, sealing, and labeling granola when “Fancy” by Iggy Azalea comes on. How can you not enjoy your work day when you get to do something you love with some amazing, one-of-a-kind coworkers! Buuuut, yeah, so I digress. Back to my point…I love baking! Nothing makes me feel more like a baker than creating beautiful breads. I am mesmerized by the the bread displays at the widely popular and prestigious Tartine Bakery & Cafe in San Francisco or Sullivan Street Bakery in NYC (just to name two). Heck, maybe this will be my next blog adventure: bake my way through a cookbook of one of these bread bakeries! 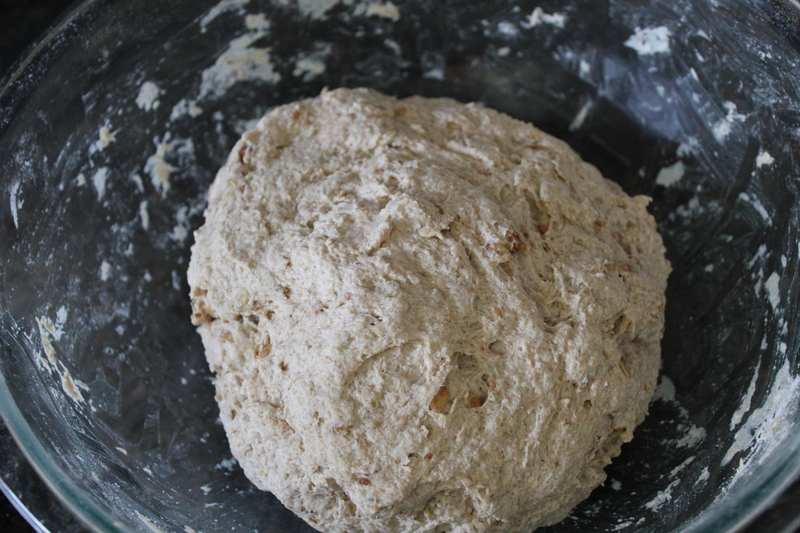 Anyway, if you share my interest, then I have a foolproof, “sit- back-and-let-the-yeast-do-its-magic” recipe for an artisan whole wheat granola round loaf. 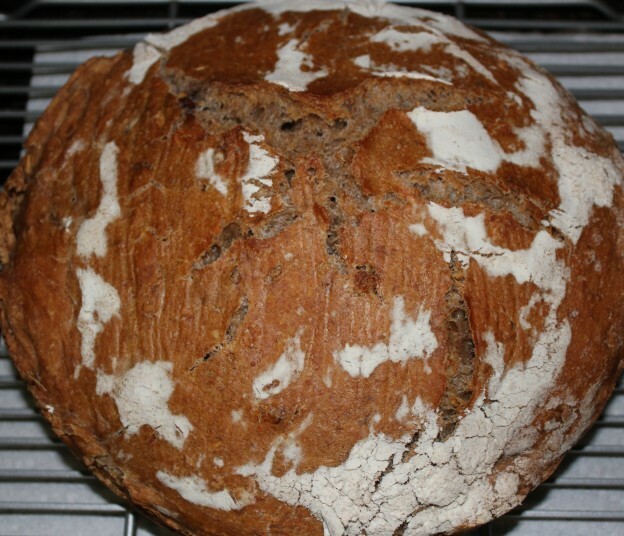 Our Bethlehem Inn All-Natural Honey Pecan variety adds the slightest hint of honey, while the roasted pecans and crispy granola perfectly spots this delightfully dense whole wheat loaf. And, just so you know, I am baking to a little bit of country pop music. Who says (well, besides my coworkers) you cannot create the perfect loaf with a little bit of good ole country twang?!? Choose your music and get to baking! 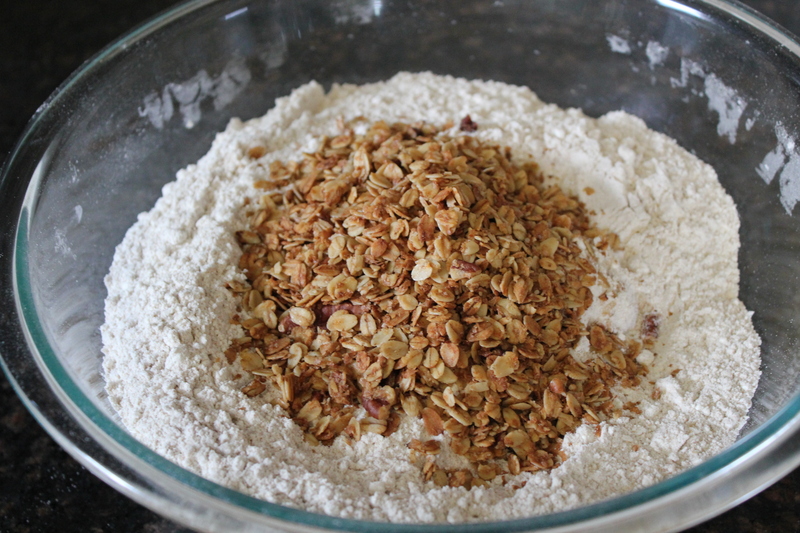 In a large mixing bowl, combine wheat and white flours, granola, yeast, and salt. Add water and combine mixture with your hands. 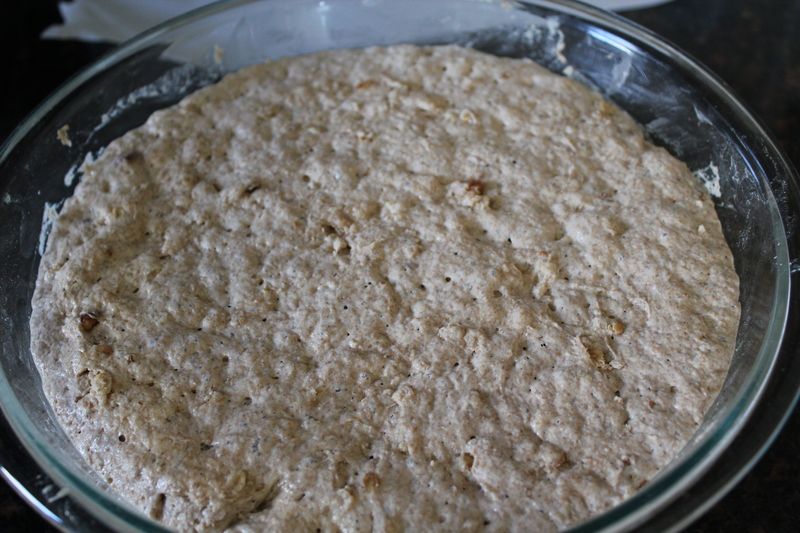 The bread dough should be wet and sticky (add a little more flour or water to accommodate if necessary). Form into a ball, cover, and let sit at room temperature for 12-18 hours. 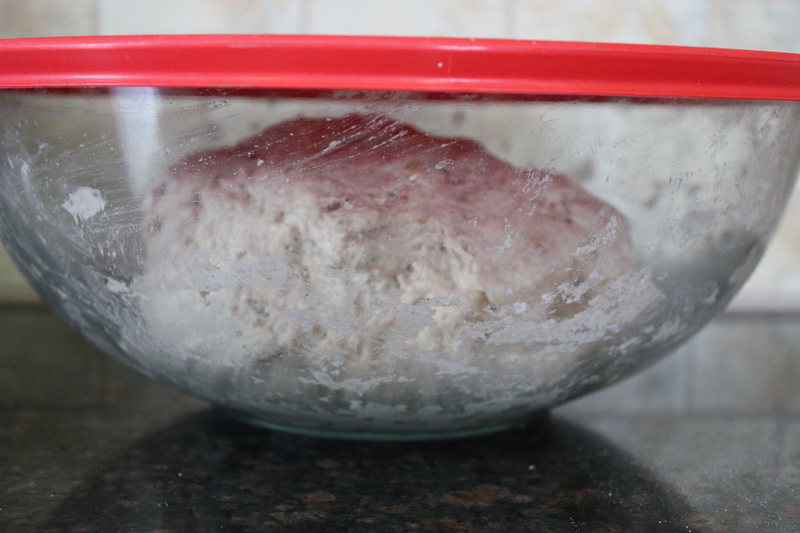 After resting, dough should smell yeasty and have a bubbly look about it. Lay out a linen kitchen towel. 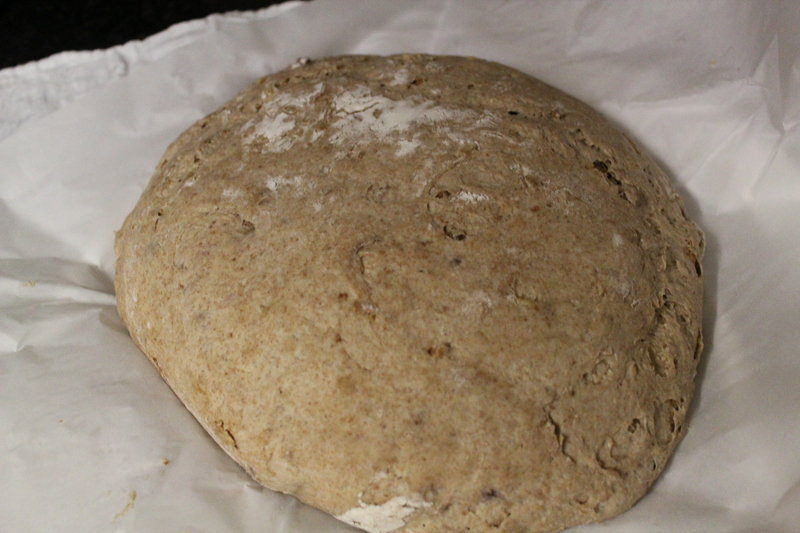 On top of that, put a piece of floured parchment paper down. 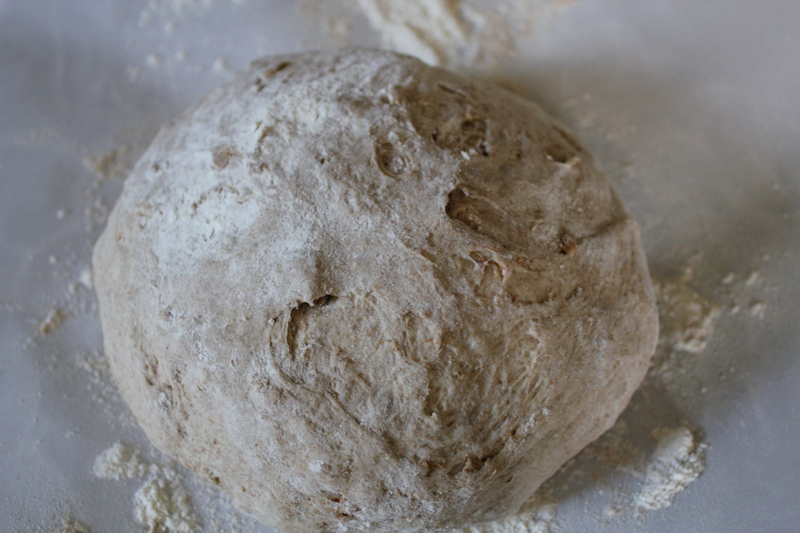 Flour your hands and grab dough from the mixing bowl, working it into a ball. Cover the ball by folding parchment paper as well as the linen towel over the dough. Let sit for 2 more hours. 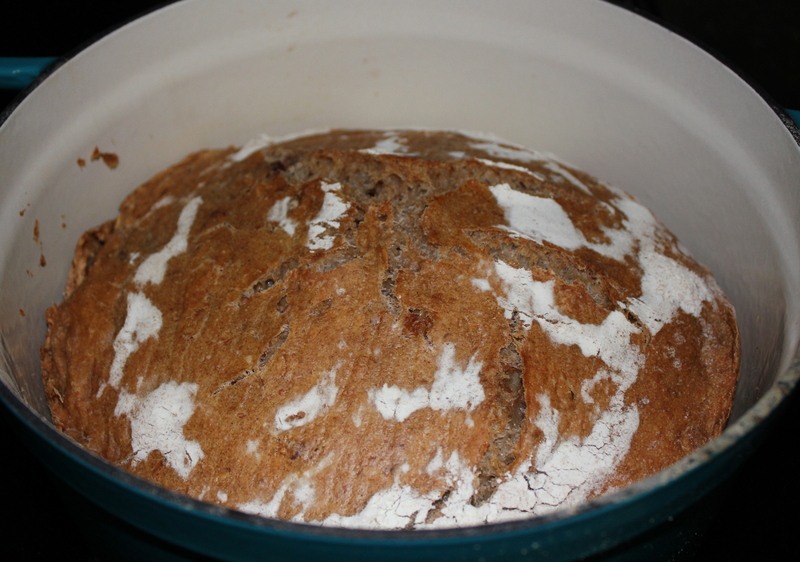 Place a dutch oven (I have a 6 quart one) in a cold oven and preheat to 425ºF. 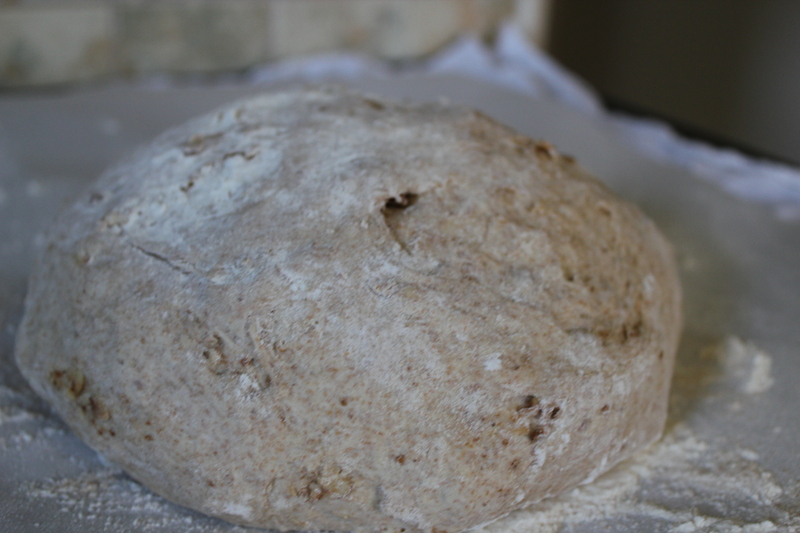 Once dough has rested, and oven is ready, uncover dough and grab the dutch oven. 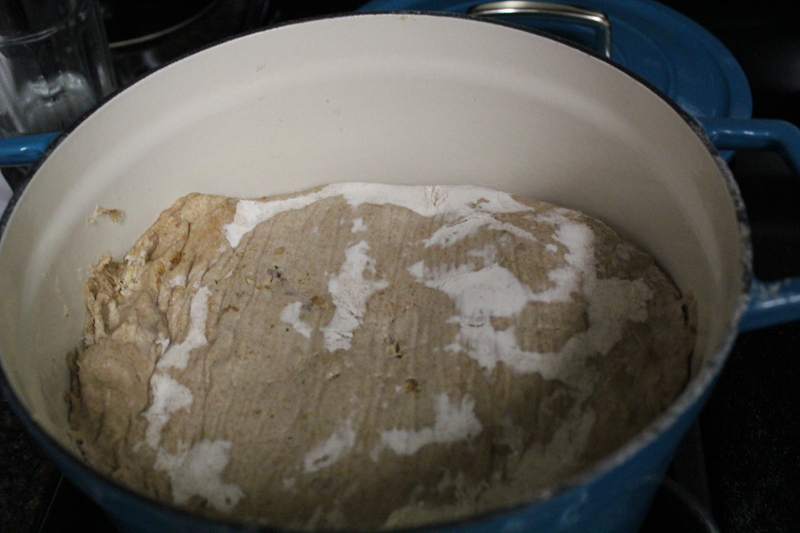 Dump the dough loaf into the Dutch oven. Return to oven to bake with the lid on for 40 minutes. 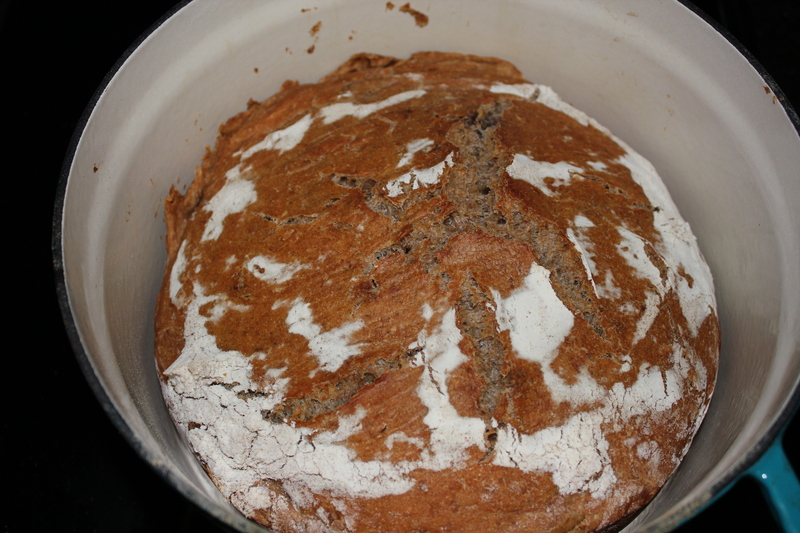 Remove the lid from the dutch oven and cook for another 10 minutes or until internal temperature of the loaf reads 200ºF. 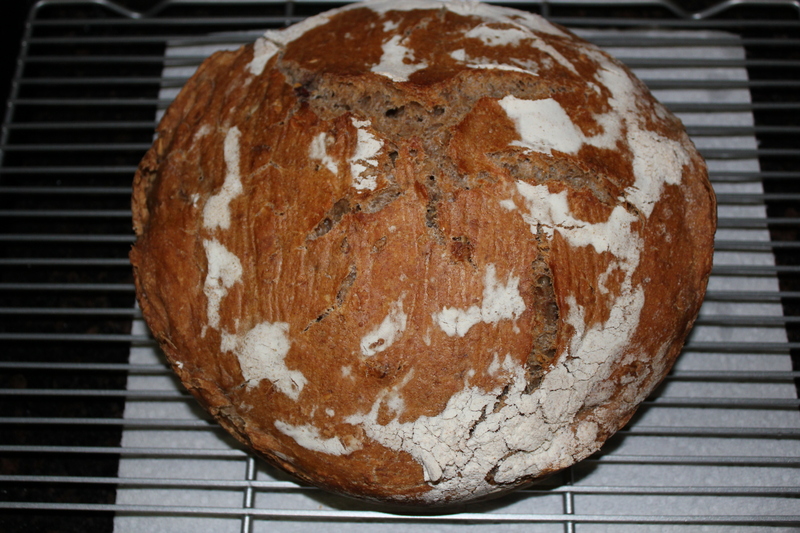 Remove round loaf from the dutch oven, and let cool on a rack. You are in for a treat! Enjoy artisan loaf with some butter and jam for breakfast, or pack a creative lunch sandwich (we made BLT’s this week with mozzarella cheese and homemade pesto sauce). 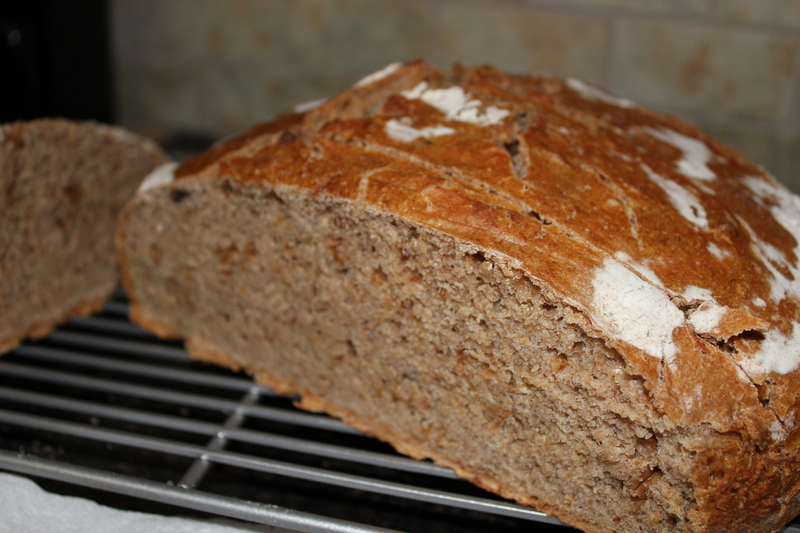 This bread is fantastic and ultra versatile.